There was a time when it would have been laughable for me to advise anyone about how to achieve a glowing complexion. I began to battle breakouts when I was a teenager and no matter what products, medications or routines I tried and tested, nothing seemed to work. Although I thought I’d someday outgrow it, those complexion challenges followed me mercilessly into adulthood, and I thought for sure I was a hopeless case. It turns out that changing my eating habits was just what I needed to turn things around, and since I’ve done so, my skin has come a long way. Top it off by drinking lots of water and following a daily routine of using natural and nourishing skincare products, and I feel like the days of uncontrollable breakouts are far behind me. 1. GlamGlow Youthmud Tinglexfoliate Treatment: yes, this product has received lots of hype; but in my opinion, it lives up to it fully. My friend Cindy first suggested this facial masque to me, and it’s become one of my favorites (I use several masques and interchange them). It treats, exfoliates and smooths out my skin all at once. I like to apply it once or twice a week and right before a special night (or day) out, as it’s the perfect prep my skin needs before applying makeup. With green tea leaves and a built-in scrub, the formula is free of parabens and phthalates and works better than any other clay masque I’ve tried. In just a few short minutes, my skin goes from dull to radiant. 2. Larenim Hyaluronic Hydration Mist: this toner mist in a spray bottle is perfect for some quick and easy hydration (I often use it in place of my regular toner to switch things up). I spray it on right after cleansing and right before moisturizing. With just a few spritzes, it’s a convenient and refreshing complexion pick-me-up. The formula is made of natural ingredients including aloe vera leaf juice, a blend of essential oils and pomegranate and cucumber extracts (plus it is paraben-free). It’s gentle, calming and the perfect compliment to my daily skincare routine. 3. 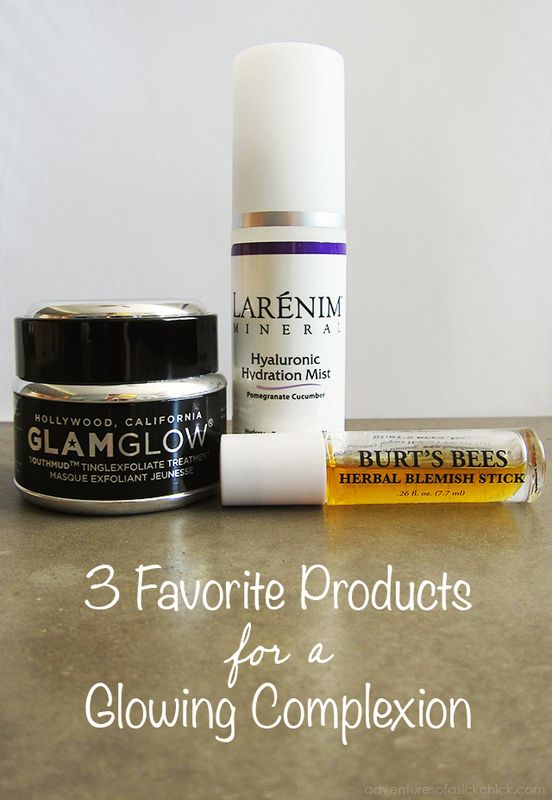 Burt’s Bees Herbal Blemish Stick: I’m slightly addicted to this handy little roll-on bottle. Even though my breakouts have greatly improved, there are still some pesky little blemishes that like to make an appearance every now and then. The moment I see a blemish in the making, I dab on some Burt’s Bee’s and stop it in its tracks. The all-natural herbal ingredient blend includes tea tree and juniper oil. Its astringent qualities creates the perfect balance, drying out those blemishes but not my skin with it. It’s seriously a must-have for minor blemish control.